Field Hockey is one of the world’s most exciting sports and is played by millions of people across the globe. It is fast-paced and requires a lot of skill no matter what level you watch or play. This method of scoring a goal involves picking the ball up on the end of the stick, dragging it forward a few meters while sliding the ball up and down the face of the stick, then finally flicking the ball at the goal. When performed effectively, the ball is fired at the goal with tremendous accuracy and at speeds of over 100kph by top-level players. 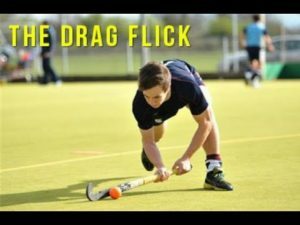 There are a lot of component parts to the drag flick skill, meaning not only does it take a long time to master but also means that the risk of injury is high if your body is not prepared effectively. A lot of younger players when attempting to develop the skill believe that all the power comes from your arms, as they are what normally provide the power for passing and hitting. However, most of the power for a drag flick comes from trunk and core rotation and legs. It is important that players and coaches are aware of this when learning and teaching this skill to minimise the risk of injury and to achieve the maximum out of their training of this skill.